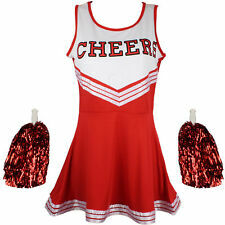 CHEERLEADER FANCY DRESS OUTFIT UNIFORM HIGH SCHOOL MUSICAL COSTUME. Condition is New with tags. Fits size 14-16. Dispatched with Royal Mail 2nd Class. Foxy Fancy Dress LTD. Dress with attached cape and lace up bodice. XL PINK 50s LADY JACKET UK 18-20 Costume Fancy Dress Brand New . The item has a size label XS but is quite suitable for. colour: red and white. DRESS SIZE: 8. RED AND WHITE. 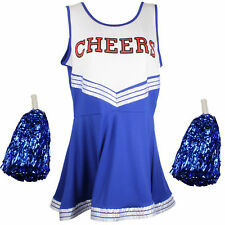 Majorette dress in blue/white Consists of a jacket, skirt with petticoat, boot covers and a hat Size 158cm height, to fit 11 - 13 Years Made from 100% polyester . 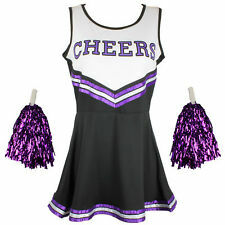 Cheerleader Costume Black with Dress & Pom Poms . 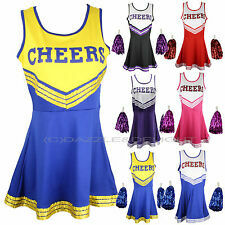 Cheerleader Outfit. Colour: Red and White. Label states size as M, size guide for M is 12/14. 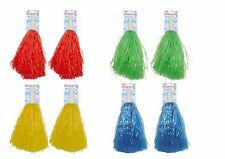 Great for Fancy dress parties, halloween, hen parties. Colour: Black and Purple.